sounds of an already recorded music as it is playing. Dj's usually showcase their skills for a live audience. Currently in Nigeria,some Dj's earn more than most music artists and are often seen as celebrities mostly because some of them were once involved in making regular music before switching to Disk jockeyin,apart from this fact,some of the best Dj's in Nigeria feature top 'A' list Nigerian celebrities in their songs and music videos. 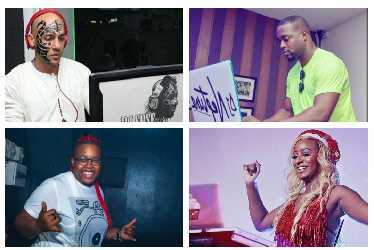 In this post we are going to take a look at some of the top 10 best Dj's in Nigeria this year. This guys smile to the bank on a regular basis,they also have bagged a lot of endorsement deals and one of them actually broke a world record. Without wasting much time lts take a look at some of the top 10 best Dj's in Nigeria currently. Dj Neptune is actually one of the best disk jockey in Nigeria. Dj Neptune was born Imohiosen Patrick,he hails from Edo State, Nigeria. He has been in the game since 2008 and has a star packed album titled 'Greatness' that featured almost all the hottest and best Nigerian musicians. According to him,he developed interest in DJing at the age of 10, he started off by learning how to Dj online by watching online DJ tutorials,he worked briefly with Ray power 100.5 FM Lagos as an in-house DJ before pursing his passion as a professional Dj. DJ Spinall was born Sodamola Oluseye Desmond.He is definitely one of the best Dj's in Nigeria. According to sources he was the first Dj to be endorsed by any brand in Africa and the first African DJ to tour in the United States. A lot of his fans think The CAP means the cap that the Dj always wear on his head,but The 'CAP' actually means:- The Crazy Azz Party. Rotimi Alakija popularly known as Dj Xclusive,is one of the best Dj's in Nigeria today. He is also a record producer and a recording artist. Dj Xclusive is holding down the 3 spot,the Dj who got married in 2015 is also the nephew to Nigerian billionaire businesswoman Folorunsho Alakija. He has released one album titled ''According to X''. DJ Jimmy Jatt was born Oluwaforijimi "Jimmy" Adewale Amu. He is one of the pioneers of DJing in Nigeria. A lot of people give him credit as one of the people that made disk jockeying popular in Nigeria. He discovered Disk Jockeying when he couldn't secure a recording contract as a young and up coming artist starting out in the industry. His albums include The Definition and The Industry Vol1. At over 50 years of age the veteran Dj has definitely paid his dues,he is regarded as one of the veterans of the profession. It's not often that you see a billionaires daughter spinning a turn able,but that is the case scenario with Florence Ifeoluwa Otedola, professionally and popularly called DJ Cuppy. She is one of the daughters of Nigerian billionaire businessman Femi Otedola. She is one of the best Dj's in Nigeria currently,in 2014 she was the resident DJ at the MTV Africa Music Awards in Durban,also in 2014 she was appointed by Nigeria's Minister of Tourism, Culture and National Orientation as the tourism ambassador for Nigeri's "Fascinating Nigeria" campaign. Dj Cuppy is also one of Pepsi's DJ ambassadors in Nigeria. DJ Obi became popular after he broke a world record. DJ Obi was born Obinna Ajuonuma,he is ranked as one of the best Dj's in Nigeria today. Dj Obi performed a 240-hour,10 day back-to-back musical bonanza,he was allowed a five minute break every hour,this feat announced his presence as one of the best disk jockeys in Nigeria. His record was however broken by DJ Colossus an American Dj. Coming in at number 7 is Dj Consequence,he is one of the best disk jockeys in Nigeria. He was born Akeredolu Precious Pelumi. The pro Dj hails from Ondo state,according to him,he started Djing from his secondary school days and was also the music prefect in his school. He is the current in house Dj for Quilox and Rumors Ikeja. Spinning in at number 8 on our top 10 best disk jockeys in Nigeria is Dj Sose. The half caste Nigeria who was born to a Nigerian father and a Hungarian Mother hails from Edo state and was born in Ibadan. He coined his stage name 'Sose' from his real name 'Soseneyayi',the dj is ranked as one of he best Dj's in Nigeria. Holding it down for the female folks is Olawunmi Okerayi,popularly known by her stage name DJ Lambo. The ogun state born Dj is currently signed to Chocolate City. She disclosed that her father DJ Tony Lewis influenced her career as a disc jockey,she eventually started her career in 2008,she was once a radio personality. The last but not the least is YBNL's very own DJ Enimoney. According to him,he started disc jockeying when he was in secondary school,back then he was called DJ Electrik. His stage name 'Eni' was formed by his brother Olamide from his real name which is 'Eniola'. DJ EniMoney real name is Eniola Olamilekan Adedeji,and he is the younger brother of rapper Olamide. He is currently the official DJ to YBNL artists.